DraftKings Sportsbook in NJ offers users the first bet matched up to $500. As one of the biggest players in the New Jersey online sports betting market, they're sure to be a standout across the whole United States. If you're located in NJ, you can now sign-up to DraftKings Sportsbook and get the best out of its promotions! Navigate to deposit options and make your first DraftKings Sportsbook deposit! If you're located outside of NJ, you can sign up for the DraftKings Newsletter to stay updated on legislative developments in your state. Is there any DraftKings Streaming Options? Is there a Customer Care team available? DraftKings Sportsbook is clearly a supporter of legal sports betting across America. For some reason, however, many lawmakers still view sports betting as a dangerous habit rather another way to enjoy sporting competitions and have fun with friends. 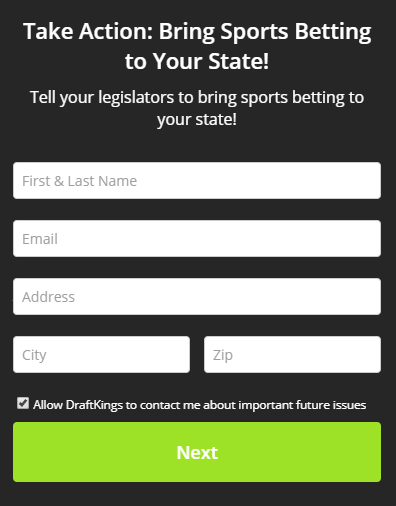 DraftKings is asking for help from the American public to write your State-level lawmakers and show them that the people want sports betting! Using their simple tool, you're able to send a message directly to your state legislator and tell them that you'd like to see sports betting come to your state. Right now, only New Jersey can reap the benefits of sports betting entertainment (and the added tax revenue for the state). Other states are missing out on the opportunity to actually do something that the average American will notice and will make watching sports more fun. The operator accepts the most common payments, and there are no accounts of problems when it comes to the operators' payment system. Remember, you can only deposit funds with a payment method registered in your full legal name. So, only use your own card, not your mom's. Of course, you can also deposit via the DraftKings app. DraftKings features the most popular sports and odds types on the front page. This way, you never have to search to place bets on the big games. Play any of the games on your desktop, tablet, and mobile. Get DraftKings for Android and iOS, so you never have to miss out on an opportunity to watch your team. 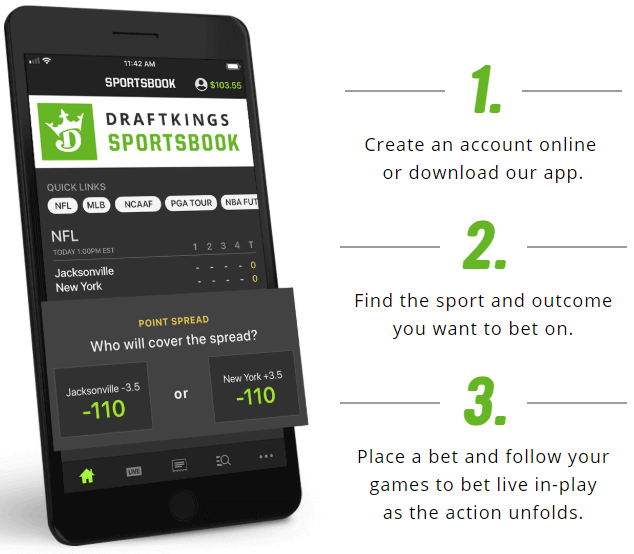 There is a lot to catch up on in the sports betting world, and DraftKings Sportsbook has taken this into account with their intuitive product. Betting is easy, with simple windows that show the most popular odds. There are also some basic betting guides so that you can get up to speed on betting lingo. DraftKings Sportsbook Pools is a new system introduced by the bookmaker that allows bettors to have fun in a completely new way. It is safe to say that the system resembles a sort of a jackpot game for passionate bettors. To help you better understand the feature, let's get into some details. The DraftKings Sportsbook Pools is a fine game that comes with a great reward. The sportsbook provides the players with numerous games. Of course, the given games are not played in a single game, but on several days, or even a whole week. The goal is to pick 13 different pairs and hope for the best. Given that entry is $20, the winnings are extremely high, which makes playing the DraftKings Sportsbook Pools even more exciting. Those who manage to score all 13 games can count on 50% of the winning pot, 30% with 12 guessed, and 20% with 11 correctly picked games. If you are in New Jersey, make sure to visit DraftKings, this is a really great game that could potentially get your adrenaline up. The operator provides you with regular live scoring updates, but it is not possible to watch the game itself. 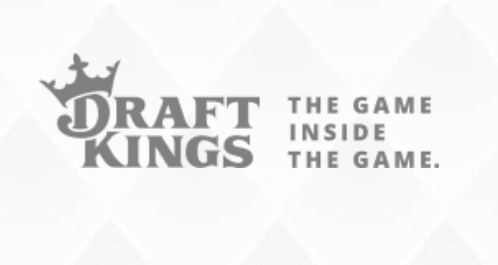 What they do have is DKTV, which stands for, you guessed it, DraftKings television where they feature analysis on games and players, and fun features like “Undercover Referee with Demarcus Cousins”, “Truth or Dare”, “Player Stories” and “Get to Know DraftKings” and many others. Considering that most people have a TV at home or some sort of way to watch games, live streaming doesn’t feel too important. These videos are a great addition to the sports wagering experience and we advise you to check it out as it can help with your DraftKings lineup. Remember that you don't need a DraftKings promo code in order to enjoy their streaming options, but you do need to have signed up with the operator. The DraftKings app is available for iOS, Android, Google Play and even on the iWatch. It’s easy to navigate and resembles the desktop version, viewing your DraftKings odds is a breeze. The app offers daily sports contests in football, baseball, basketball, hockey, soccer, MMA, auto racing, and eSports for real cash prizes. The reviews of the DraftKings app are predominantly positive, ranging from 4.3/5 to 5/5. They make regular updates to fix bugs, and to ensure that the app offers as many possibilities as the website does. The DraftKings app is an easy way to keep up with your DFS team when watching games on TV. You can also use the DraftKings promo code when signing up with the operator on your DraftKings app. If you’re having problems with the DraftKings promo code, email them at [email protected] Fill out a form if you'd rather get a call from a person. Customer care availability is around 24/7 for the DraftKings sportsbook. But remember that the operator also has a customer services section that is useful and easy to navigate.